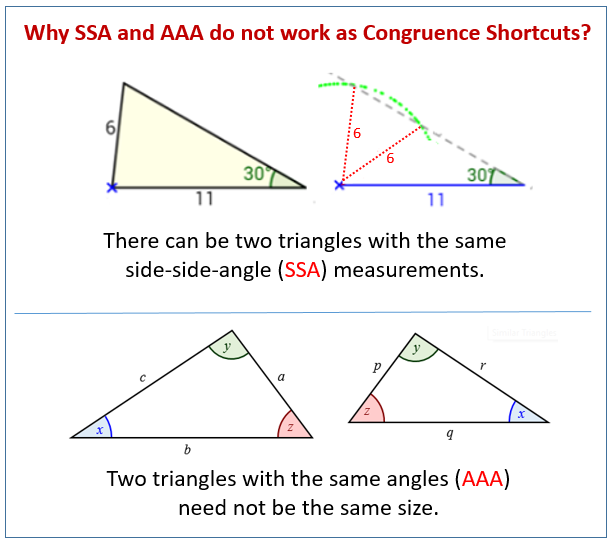 Why SSA and AAA are not Congruence Shortcuts? Examples, solutions, videos, worksheets, games, and activities to help Geometry students learn why side-side-angle (SSA) and angle-angle-angle (AAA) are not used as shortcuts to prove the congruence of two triangles. Why SSA and AAA Don't Work as Congruence Shortcuts? There are four shortcuts allow students to know two triangles must be congruent: SSS, SAS, ASA, and AAS. However, knowing only Side-Side-Angle (SSA) does not work because the unknown side could be located in two different places. Knowing only Angle-Angle-Angle (AAA) does not work because it can produce similar but not congruent triangles. The following diagrams show why SSA and AAA can not be used as congruence shortcuts. Scroll down the page for more examples and solutions. An exploration of the concept of side-side-angle (SSA) congruence for triangles. Why SSA is NOT a congruence shortcut? Explains why side-side-angle (SSA) is not a shortcut to prove congruence of two triangles. Patterns that do not guarantee congruent triangles (AAA, SSA).